Finally... exactly four years after HfS introduced the concept of Robotic Process Automation (RPA) to the services industry, we can reveal to the world how our service provider and advisor friends are performing with the industry's inaugural HfS Blueprint report on Intelligent Automation. Back in 2012, HfS brought the topic of RPA (see link) to the attention of the sourcing industry by challenging its dependency on low cost labor made widely accessible through the ubiquity of global sourcing resources. The report, “Robotic automation emerges as a threat to traditional low‐cost outsourcing,” examined whether affordable, easy‐to‐develop software robots would eventually supplant many offshore FTEs to drive down the cost of outsourcing to an entirely new digital level. We concluded that robotic automation, or Robotistan as we affectionately called it nack then, had immense potential to be a highly disruptive and a transformative technology for buyers and service providers that would forge a whole new services industry landscape that incorporated truly global operating models that not only took advantage of globally available labor, but also accessible technology that could help digitize, streamline and standardize business processes. This wasn't only about making thing run more affordably, but this was about helping enterprises digitize their business operations more effectively to respond to their customers', partners' and employees' needs... as those needs arose. That was then, and was just RPA. Fast forward 4 years, and the broader notion of Intelligent Automation (IA) is not only top mind of BPO executives but across the whole industry as all the facets of IA are about decoupling routine service delivery from labor arbitrage. However, despite the high profile, the understanding of how IA is impacting the industry is at best blurred as the marketing communication is both scarce and often confusing. Normally, no topic is small enough to be hyped, to be shamelessly exaggerated. Yet, in the context of automation the usual suspects, the service providers, ISVs and sourcing advisor remain coy and largely on the sidelines. Probably the two key reasons for that are that the impact on revenue models is not well understood and the disruption among workforces, the fear factor, the connotations around the topic. As such as our own Lee Coulter aptly put it, in the context of IA we have something akin to the Tower of Babel. We have many languages but can’t understand each other. Enough reasons for our Intelligent Automation expert in residence, Tom Reuner, to take stock as to where the development of IA has advanced to. Tom, there appears to be a lot of noise around Intelligent Automation in the industry? Is the hype justified and where does it fit in strategically for buyers? Noise is probably a good way of putting it, Phil. While many talk about automation or least refer to it, few actually provide insights about the market dynamics or even educate stakeholders about the many implications of IA. In my 20 years of being an analyst and consultant I can’t think of any comparable topic where the industry is so coy of effectively engaging with stakeholders. Thus, it is (the often tiny) automation tool providers and the specialist consultants who are leading the marketing communication and are educating the market. While the market is still nascent, we are seeing signs for exponential growth kicking in. Both in terms of build out of capabilities by the supply side as well as by the scale of the deployments. The best way to think about it is the hockey stick effect, and we are starting to get to the long shaft of the stick representing hyper growth. As for your question, as to where IA fits in strategically for buyers, the answer is it is in the eye of the beholder. And this is not the usual analyst cop out. It really comes down to how stakeholders are approaching IA and what their requirements are. For HfS, the relevant context is service delivery and not function and features. Consequently, the discussion should focus on specific use cases and not generalist statements. Regardless of the specific use cases, IA is a critical building block for organizations journey toward the As-a-Service Economy as it is significantly accelerating the speed of service delivery and moving toward notion to straight-through-processing. Critically, the mainstream view is that bots, robots and algorithms are supporting and augmenting IT and business analysts rather than supplanting them. Thus, notions of a virtual workforce are pointing toward blending bots and human workers. However, particularly among the more business process centric supply side, we are expecting widespread disruption as generic activities such as compliance, reconciliation, data entry etc. will be phased out and we will see a shift toward higher value activities such as analytical and cognitive skills. Therefore, we need urgently a fundamental debate about the transformation of knowledge work in order to help organization on this extremely challenging transition. How are the winning service providers approaching Intelligent Automation today? What are they doing beyond more low level RPA? Phil, to answer your question, let me level set on the key criteria that we were assessing the service providers on. What we were trying to assess was how service providers are orchestrating diverse sets of automation within the context of service delivery. How are they proactively transforming the processes for clients? Thus, the emphasis is not on task automation or isolated point solutions, but on automation from a business function or process point of view. Similarly, advisory is only relevant as part of implementations. These capabilities might sit within traditional business units, but we are seeing the leading providers build out capabilities across those business units. While IA can be an internal capability for delivery and costs optimization, we are trying to understand with this Blueprint is how IA is helping clients on their journey toward the As-a-Service Economy. Against this background, the pace of change in building out IA capabilities is nothing short of astounding. All providers have built out centers of excellence that tend cut across the entire Continuum of Intelligent Automation ranging from RPA on the business process centric side to Cognitive Computing, AI all the way to self-learning and self-remediating engines. In this increasingly crowded space, Accenture stands out through investments in a holistic automation strategy. The reference point is the Accenture Intelligent Automation Platform integrates Business Workflow Management, Delivery Management, Intelligent Automation, and Analytics and Insights, with a neutral ERP interface at the core. This is further enhanced by the Accenture AI Engine that provides an architecture abstraction layer for interacting with various AI based services, such as natural language processing (NLP) and machine learning. In contrast to Accenture, IBM is pursuing a highly pragmatic strategy by driving scale through focus on core technologies: IBM is focusing on three core technologies and driving them out at scale: Blue Prism in RPA, IPsoft in Autonomics, and Watson as a virtual agent and broader analytics scenarios. This allow not only for scale but also results in robust delivery. These leaders are joined by Cognizant, Genpact and Atos in the Winners Circle. Cognizant is a reference point for thought leadership. Its automation team within the Emerging Business Accelerator (EBA) is at the vanguard of educating the market place on the implications of automation. Genpact stood out by proactively providing innovation. Clients praise Genpact for consistently proposing innovation. This includes a consistent approach to monitoring even for activities that are outside of scope. And last but not least, Atos stands out by driving IA at the heart of its service delivery backbone. This includes linking business services and applications orchestration with infrastructure cloud provisioning. A crucial element in this strategy is integrating big data and operational analytics into the automation approach. What are the main lessons coming from the early deployments? What are the issues buyers should look out for? Look beyond task automation: The marketing noise is largely around RPA and implicitly notions of task automation. Therefore, it can be challenging to get a sense of the bigger picture. However, as one provider aptly put it: “Automation success starts with good design, efficient processes, and data curation.” Crucially, what is the future state and how do organizations get on the path toward the As-a-Service Economy? Automation is a journey: Automation is not a quick fix; it is a journey. It takes preparation to find the right candidates and can be done effectively only by taking support from the people who are involved in the business or IT operations. Projects should start with advisory and process consulting. Data curation is critical: Applying Cognitive and machine learning solutions to IA requires access to large amounts of relevant data to build reliable models. Data can be pertinent to IT operations, business processes, and publicly accessible data. Thus, there is a need for quality and quantity of the data, and associated compliance considerations are often under-estimated by clients when they consider AI-based automation solutions. How will all of that impact workforces, Tom, and what are the broader implications for talent? Are the fears justified or is it plain scaremongering? Phil, this is probably the most contentious issue. We all have seen the studies by McKinsey and the World Economic Forum predicting the loss of hundreds of millions of jobs or Gartner’s assertions that in 2018 3 million employees will be managed by a robo-boss. HfS is taking a more balanced view that is both specific and relevant to our industry that we need an urgent and honest debate about the transformation of knowledge work. And you have been quoted left right and center that digital disruption is killing jobs – not automation. For me two issues are standing out. First, successful automation projects require a proactive stakeholder management that is taking the concerns of employees serious. Change management is crucial for achieving projects goals. While anecdotal, examples for successful projects were where employees were giving automation terminals names and even window seats as they freed up from mundane and often boring tasks. Second, and very close to my heart, we need to rethink our approach to talent. Data scientists and cognitive skill sets are not growing on trees. Universities have to start adapting their curricula. But even more importantly, organizations have to fundamentally revisit their strategies on talent. Many activities that their employees will do today are not needed anymore in 2 or 3 years’ time. Will the juggernauts finally start to properly engage with clients and stakeholders around the notion of Intelligent Automation? How do you see the market evolving in the next few years? I am not holding my breath that the juggernauts will start to properly engage with stakeholders on the topic any time soon. It is a classic case of innovators dilemma. Many will continue to make more money with labor arbitrage. In the same vein the automation giants such as BMC or CA are ringfencing their licenses. But make no mistake, they are evaluating M&A opportunities and will pounce when they feel the time is right. In terms of market evolution one of the key findings of this research is the emergence of Virtual Agents. These agents (ranging from the big beasts Watson and Amelia to OpenSoure avatars) are underpinned by broad process and automation capabilities. The case study that highlights this best but also underpins that looming disruption is KPMG. KPMG is anticipating and investing significantly in the disruption of their core business (tax, accounting, advisory etc.) through robo-accountants and advisors. And their core business is not high on the technology affinity list. And this disruption is not 5 or 10 years out but over the next 2 or 3 years. So, what is direction of travel for the further development of IA? HfS believes the more service delivery is industrialized and automated, the more differentiation as well as value creation will be at the intersection of standardized service delivery and the plethora of unstructured data that will be increasingly integrated through neural networks and deep learning. Thus, vertically relevant insights and data is likely to be the endgame for both automation and service delivery. And it is here, where the providers in the Winners Circle are focusing their investments in and are ahead of the game. 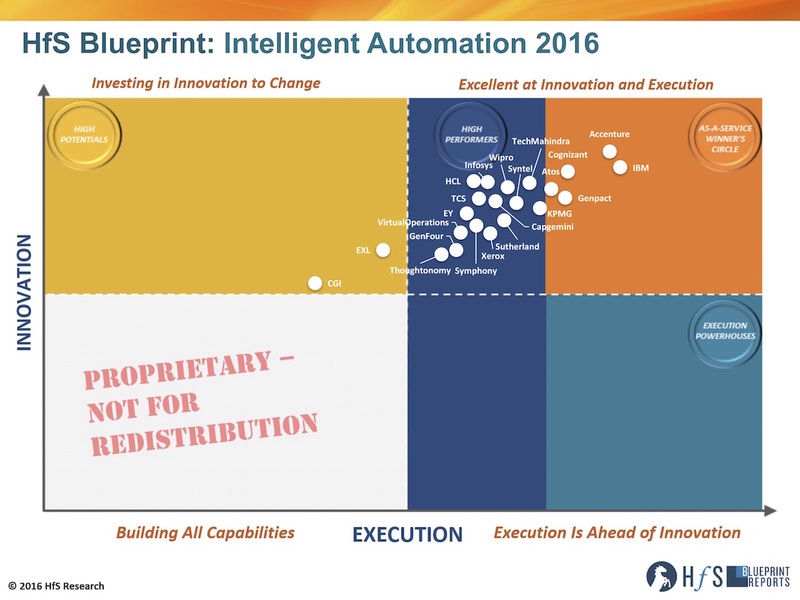 HfS Premium Subscribers: click here to download the new HfS Blueprint Report, "Intelligent Automation 2016"